A man examines hardware at the NRA convention in Dallas. Our liberal gun lover takes in the scene at — and surrounding — the NRA Convention. I think about guns a lot. I think about them in very specific ways. You might say, for example, that I spent part of my weekend thinking about a Beretta pistol that I own. I would say I spent much of my weekend thinking about my Beretta PX4 Storm Compact Carry, and even more specifically about when and how I would install a new Langdon Tactical 11-pound chrome silicon hammer spring within its trigger group and attach micro-thin rubber Talon grips to its technopolymer reinforced fiberglass frame, all to improve the gun’s performance and handling. This is one tiny example of why I’m often referred to as a “gun nut” by my mostly liberal, gun-wary friends. I think about the NRA a lot, too. I think about it in very specific ways. You might say, for example, that I spent much of my weekend thinking about the NRA convention in Dallas. I would say I attended the convention (as well as a nearby protest), but I spent most of my time thinking about the many cool guns in the exhibition hall that I got to handle or make inquiries about. When I did think about the NRA itself, it was mostly about the weird place I live in the gun policy spectrum: I’m a gun lover who firmly believes the NRA is America’s Hezbollah, a militant, terrorist-supporting organization that is beloved by a rabid base because it has expertly weaponized the politics of fear and positioned itself as the champion of a voiceless minority. 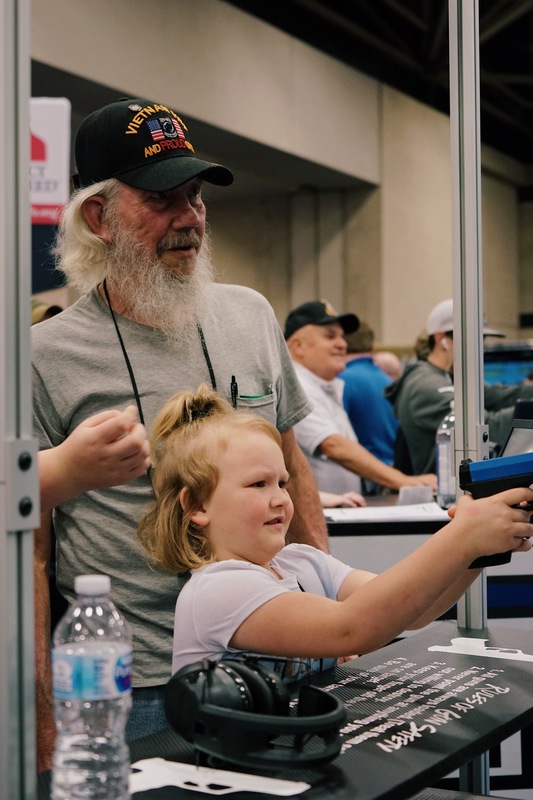 My relatively unique perspective — which I dub “how to be hated by everyone” — is why D Magazine asked me to report on what I saw at the NRA convention this weekend. “Don’t get shot,” my fiancée says as I get ready to leave Saturday morning. I’m headed first to check in on an anti-NRA protest within a few blocks of the convention center at Belo Gardens before moving to the convention proper. I’m trying to figure out how best to dress for each occasion. I think perhaps I could wear my “Resist” t-shirt to the former, then take it off to reveal my Beretta tee to the latter. I opt for neither. Since I’m sure you’ll ask yourself: yes, I have a concealed carry license. No, I was not packing anything other than a Leatherman multitool and Apple earbuds. Being there early helps since it means I get to spend some time with NoRA leadership. Ben Jackson is a longtime friend of Milano. He talked to me about the many ambitious goals of the group. Jackson’s focus sounds admirable. I don’t know how you’re going to raise the tens of millions of dollars annually it would take to counter the NRA’s campaign spend, but I’m all for celebs and artists and rich folk pouring their money into trying. But that does seem to be treating the symptoms, not finding a cure. When polls show that two in three voters or more want sensible gun laws, and that Republican support for such laws (mandatory background checks, three-day waiting period, a ban on bump stocks, etc.) is higher than ever — this speaks to his point just how the government is broken, in that it doesn’t represent the will of the people, because it’s more important to defend the outsize contributions of groups like the NRA. 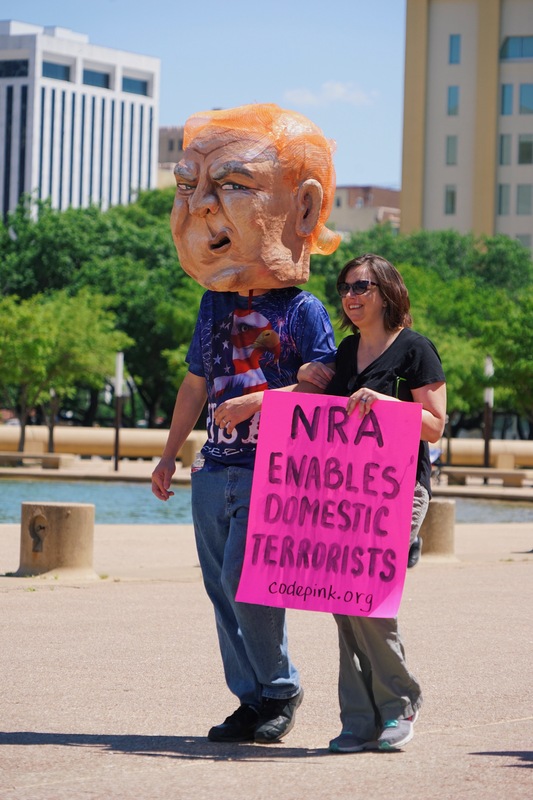 Protesters outside City Hall during the NRA convention in Dallas. Photo by Creagh Cross. The rally begins. Pro tip: if you simply call it a “news conference” instead of a “rally,” it looks pretty well attended. Milano lays out the group’s bill of rights, its idea of what sensible gun laws look like. Fred Guttenberg, the father of Jaime Guttenberg, a 14-year-old who died in the Parkland, Florida, school massacre, gives a heart-wrenching look at what happens when gun violence finds you and your family. It’s at this point when it’s fair to ask, “Did you feel proud being a gun owner when you heard his speech, Eric? Do you feel good about your little hobby now?” No, I don’t. I can give you all kinds of excuses of how I square this with myself. I don’t buy AR-15s or other weapons of war. I only own shotguns, pistols, and one bolt-action rifle. I shoot for sport (clays) or marksmanship and self-defense training (courses with seasoned instructors) or just for fun at the range. But I’m not blind to the fact that my rationalization is common and weak: We may have too many guns, and they may be central to our culture of fear and violence, but I’m not part of the problem. I asked how he was sure there were 80,000 NRA attendees. Outside the convention center was a long line of rideshare bikes, a setup for a joke I’m not clever enough to deliver. Once inside, I met up with my soon-to-be brother-in-law, Brian, a Fort Worth police officer. Brian was my gateway into guns. One day years ago, just to show it off (and I think to watch me squirm), he handed me his short-barreled Remington 870 shotgun, the type of which he’d used when “exigent circumstances” necessitate a door breakdown and possible close-quarters action. Because the barrel was only 14 inches, it requires a $200 tax stamp and months of waiting for the paperwork to go through. But I didn’t know that at the time. I just knew it was very cool, and I was extremely nervous holding it. I think he was highly entertained. After carefully handing it back to him, though, I did admit that, since my adult daughter was long out of the house, I was worried about protecting my fiancée, his sister-in-law. I’ve had my house broken into when gone. And she once hid under the bed when an intruder cased her house while her parents were away. We had an alarm, but it felt like a fairly flimsy defense system. Brian thought it was insane that I had no other home defense system. As a cop, he sees the world differently. To him, it is an inherently violent place. You can choose to defend your home or not, but to convince yourself that all you have to do is let the alarm beep and then call 911 is foolish. I didn’t even know how to operate it, I told him. “It’s easy — it’s a shotgun.” He showed me how to load and unload it, showed me the safety, and handed me a box of 12 gauge shells. Petrified, I wrapped it in a blanket so I could get it inside my house without any of my neighbors seeing it. The first thing I did, with my fiancée, was take an “intro to shotgun” course at DFW Gun Range. Then I took another one. Then I practiced every few weekends. Then I started watching a well-produced video series on the Lucky Gunner website about self-defense shotguns. Then I started lusting for better shotguns. I sold the Savage and got a Beretta 1301 Tactical semi-auto shotgun. Then I got a red dot sight for it. Then I got a shell carrier. Then I put a Magpul stock on it. Then I started ordering ammo anytime it was on sale. And I started taking more advanced shotgun defense courses. Then I bought a Mossberg pump shotgun because I missed having a pump. Then I bought a shotgun for clay shooting. Then I bought an old cop 1981 Winchester 1200 shotty with a maple stock in cherry condition because, man, that thing is sweet. In between I started taking pistol courses and buying and selling handguns and 9mm carbines and slings and scopes and lights and then, hey, why not knives, they’re cool, too. Then I got a membership at DFW Gun Range and I try to go shoot there or at Elm Fork every other week at least. There’s always something that needs to be shot, sitting in the gun safe, calling to me, like the ring calls to Gollum. Needless to say, I was excited to see all the gun gear at the convention. I am an internet and YouTube savant when it comes to browsing gear reviews and buying online. (It shocks people often that it’s very easy to buy guns, ammo, and accessories online and have them shipped to you. Most of it goes to my PO box, but guns go to your government approved dealer, who performs the necessary background check. The concealed carry license makes this easier, which is one reason I have it.) But being able to see, hold, and test the gear — as much as it’s possible to test a gun — all in one place, that’s the appeal of gun shows — which I won’t attend, because of my admittedly warped idea of what makes me a good liberal gun lover. Brian caught up during the long trek from the front doors to the exhibit hall. Brian is more a provocateur than he is ideological. His wife is vegan, his daughter a lesbian. He’s very much a live-and-let-live kinda guy (good thing for a cop). But it’s undeniably fun to trigger liberals, me included, so he can spout some Fox News silliness when he wants to get a rise out me. Mostly, though, as far as I can tell, he just believes that gun ownership is a sensible right — and he can’t help it if most of the people who take advantage of it are idiots. Brian goes back to work, so I start my adventure through the hall. Let me paint the scene for you: it’s a trade show. An exhibit hall. You’ve seen one, you’ve seen them all. This one is just a) pretty big, and b) chockablock full of guns. Feeling the weight of a handgun inside the NRA convention. Photo by Creagh Cross. Some of the new to new-ish items that caught my eye: Horns for Heroes, knifes and chandeliers and artwork made of horns; a new type of “weapon support system” to keep your AR-15 pointed at your crotch so you can go hands-free; a million new suppressors, one of the fastest-growing sales areas in the gun world given potential silencer-friendly legislation (they’re not silent, and I actually think they’re helpful for home self-defense, given how loud guns are); concealed carry bellybands for runners; magazine-fed shotguns by both Remington and Mossberg (I think they’re ugly and unneeded); the first left-handed M-14 rifle (I am cross-eye dominant, so I shoot firearms with fixed stocks left-handed); and baby-size high-quality gun safes, one of which I discovered had a toddler playing inside, so I guess it’s really toddler-size. And guns! Tons and tons of guns. I mostly gravitate to four gun manufacturers: Beretta, Sig Sauer, Mossberg, and Smith & Wesson. (Unlike everyone who became a gun owner in the past 20 years, Glocks don’t do anything for me.) Those are the gun company stations where I want to spend the most time examining the finish, testing the grip and trigger, and dry firing into the ground a list of guns that intrigue me but, to that point, I haven’t gotten my hands on. Now here’s the part where I have to acknowledge that gun makers are inherently evil. And it’s not just that they fund the NRA, which in turn acts as its policy attack dog. And it’s not just that they take no responsibility for what evil these tools can commit in the wrong hands. It’s also for more mundane reasons. Like the fact they own and run almost the entire gun media, most notably NRA TV and its on-air band of anger management cases, but also most of the “GunTubers” on YouTube who suggest they’re objective gear reviewers or self-defense experts. (Two exceptions: the excellent Chris Baker at Lucky Gunner Lounge, and the very knowledgeable, informative, oddball wingnut who goes by Nutnfancy.) Yes, everyone I’ve met from a gun company seems like a nice guy. The folks who make the self-help videos for Beretta and Sig and the others seem like great folks. But a company, like any membership advocacy organization, is whatever it does at the extremes. You ignore your part in mass murders, you don’t get extra credit for running a great safety program, too. That said — hold on, about to make a violent 180-degree Rockford turn in my intellectual Camaro — I am crazily excited to get my hands on the gun everyone has been talking about since it debuted in January at Shot Show 2018: the Sig P365. I own a P320, which is the civilian version of the handgun the military just adopted, and it’s a fantastic gun. It melts into my hand, the trigger had a crisp break and a short reset, and it just looks cool. But it’s too big for concealed carry, and for self-defense I prefer double-action/single-action triggers, like in my Berettas. That’s because the first pull of the gun is long and takes much more effort. You have to want to pull that trigger. Darryl Bolke — a longtime cop, renowned shotgun and firearm trainer, and local security expert — recently told me he recommends everyone has a double action trigger handgun, but especially civilians. Because, he says, most striker fire triggers, like in my P320, are too easy to fire accidentally under stress of a home defense encounter. They’re also more dangerous when drawing or holstering, as a DFW Airport cop found out this weekend. Thus it is my favorite gun consigned to range work. But the P365 is meant to be a gun that is small enough for concealed carry, with enough ammo capacity (10-12 per magazine) to use in a home defense situation or just a day at the range. Like all Sig products, you can feel the quality of craftsmanship as soon as it slips into your hands. It’s light and small, but not too much so. Tiny guns are notoriously “snappy” and hard to shoot. I’ve sold both my “pocket-size” pistols because they are incredibly uncomfortable to shoot. But the P365 — so named because, in theory, you can use it every day for whatever your needs — does feel great. “We’re selling 3,000 a week,” the guy behind the counter says. I worry that may be 3,001 if I don’t run out of there. Military cosplay: The way the gun lobby and hardline “cold dead hands” types suckle at the teat of the military to give them a protective force field from criticism is appalling. Many woke veterans talk often about how they don’t appreciate some NRA virtue signaler invoking a veteran’s service every time they post an all-caps comment. But on the ground floor, here at the convention, it’s just funny. Each gun manufacturer competes to say they’re the most military. I’ve kissed up to Sig, but their entire marketing campaign around this gun is all about what a great weapon of war it is. I’ll ignore its overt racism long enough to say: irony is dead. Old fat white people: I’m a 50-year-old pale chub. I know my people, and they were asses-to-elbows up in that piece. The New Yorker’s great southeastern correspondent Charles Bethea pointed this out in his coverage of Friday’s festivities. The problem of race and guns is complicated and real, as Childish Gambino brilliantly noted this weekend. The modern NRA itself was fashioned from a takeover from a radical wing of members intent on turning a sleepy hunting-first organization into a maniacal political force. It’s a wild story, one that involves the Black Panthers. (Listen to this fantastic More Perfect podcast for the story.) And, yes, I know that one of NRA TV’s stars is black, and he lives in Dallas. I saw a few black people there, and a few brown people, too. But the NRA is not at all representative of America, let alone the many poor brown and blacks who feel they need guns to protect themselves in very violent neighborhoods. The NRA is not exclusive to older, suburban or rural, white people by design. It is so by because of what the NRA stands for in the subtext behind nearly every statement it makes or declines to make: fear of a black/brown/progressive planet. Just listen to this quote from NRA CEO Wayne LaPierre, delivered to an almost entirely white audience this weekend: “America, our precious country, is teetering on the abyss, and this coming election is a guarantee of our worst nightmares if we don’t reach from one end of the country to the other.” This followed a video shown before President Trump’s speech targeting “the ungrateful” — Black Lives Matters protesters. There are fewer coded messages in National Treasure. I agreed. But I guess I never really thought I would get shot. Because … I don’t know. Maybe it’s just that I don’t want to believe that I have to wear my gun everywhere, even though I could do so legally. Even though I’ve trained to do so and will continue to. I got home late. I pulled out my PX4 Storm. Watched some videos on how to replace the hammer spring, then did so. Attached the Talon grips. Dry fired it. The trigger is so much smoother. The gun points naturally. I can’t wait to shoot it.